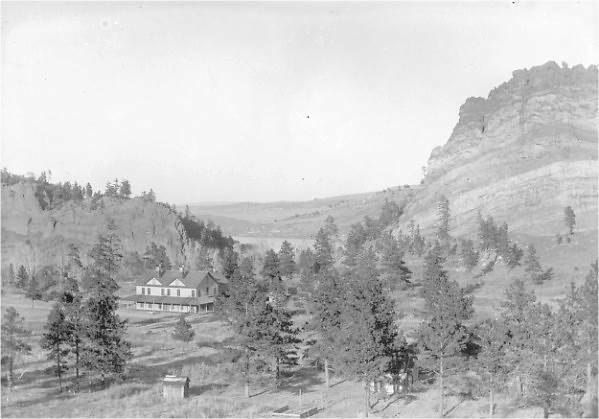 The Friday, August 14, 1903, issue of The Castle Rock Journal featured the front-page headline: “Perry Park Visited by a Genuine Cyclone.” Underneath was a picture of “Nanichant Inn, Perry Park, Colo.” One hundred years ago “cyclone” and “tornado” meant the same thing—any kind of a land based circular windstorm. Considerable damage was reported by the cyclone. The exterior of Nanichant Inn, built in 1887, suffered when a heavy object flying through the air knocked a large hole in the side of the hotel and boards were shattered for several feet where the object struck. Fortunately, not a pane of glass in any window was broken. Various buildings on the grounds and tents galore were scattered in pieces of various sizes and shapes. One of the largest tents was wrapped around the highest branches of a tall standing tree. It “was almost a miracle that the occupants of the tents and cabin were not killed instantly by the falling trees.” Two wooden beds in a tent were carried over 100 feet and landed—unscratched– side by side, still upright in the thick forest. The park lost much of its beauty caused by the uprooting of many fine shade trees.